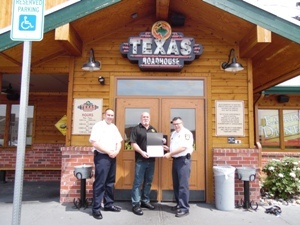 Today, Chief Leonhard and Assistant Chief Ulrich presented Managing Partner Mark Spencer of the Chambersburg Texas Roadhouse with the American Heart Association Heartsaver Hero Award. A patron of Texas Roadhouse was choking on a piece of food on January 28, 2015. After several attempts to dislodge the food by the patron and staff, Mr. Spencer successfully attempted the Heimlich maneuver and dislodged the airway obstruction prior to Fire Department and EMS arrival. The patron could have experienced a completely different outcome without Mr. Spencer’s intervention. The Chambersburg Fire Department would like to thank Mr. Spencer for his quick response in this emergency situation.